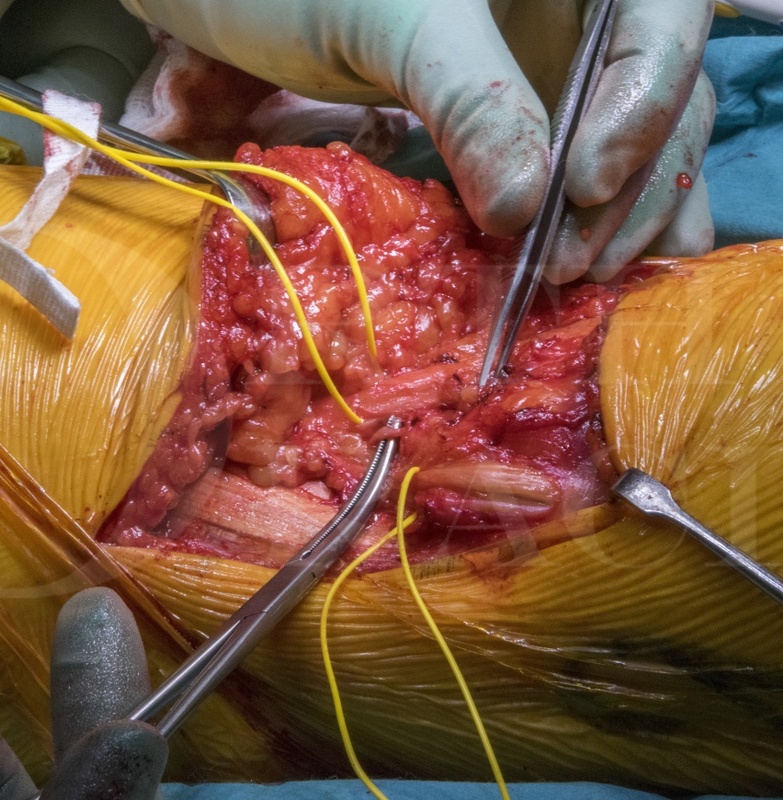 Learn the Excision of synovial chondromatosis using a posterior approach to the knee surgical technique with step by step instructions on OrthOracle. Our e-learning platform contains high resolution images and a certified CME of the Excision of synovial chondromatosis using a posterior approach to the knee surgical procedure. Primary synovial chondromatosis is a benign, metaplastic and chondrogenic disorder of the synovium most commonly involving the knee, in two-thirds of cases, of middle aged patients. Extra-articular synovial chondromatosis may occasionally be encountered in hand and feet. Symptoms include firm articular swellings, which my be painful or associated with mechanical locking, restriction or crepitus. Radiographs and CT highlight small rounded calcifications at the periphery of the joint. The standard initial treatment for symptomatic patients includes joint-preserving arthroscopic or open resection by way of synovectomy. Incomplete removal will likely result in local recurrence, reported in up-to 25% cases. If asymptomatic, clinical and radiological surveillance may be acceptable to both patient and surgeon. Secondary synovial chondromatosis, characterised by loose bodies within degenerative synovial joints, is associated with degenerative joint disease for which the management is the same as the primary aetiology i.e. non-operative management of osteoarthritis prior to joint replacement surgery. Rarely, secondary synovial chondrosarcoma has been reported to arise in primary synovial chondromatosis; symptom progression over several months (82%), rapid recurrence after complete resection (30%), and medullary canal invasion (43%) are associated with malignant change (https://www.ncbi.nlm.nih.gov/pmc/articles/PMC5481616/). When there is anxiety regarding diagnosis, disease extent or malignant transformation, referral to a specialist orthopaedic oncology centre may be preferred, but the majority of cases can be managed in non-oncology units. Author : Mr Jonathan Stevenson FRCS (Tr & Orth).